McMinnville, Oregon, August 29, 2016 – Beyond a chain link fence, tucked behind a hanger full of gleaming Cessnas, is a small outbuilding with a German Shepard sleeping on the front porch. Jerry Trimble Helicopters, located directly across from the Evergreen Aviation Museum in McMinnville Oregon, is one of the first FAA testing centers to offer the 14 CFR Part 107 Remote Pilot Exam in Oregon. I arrived at 9:45am and, after stepping over a dog and two baby kittens, was surprised to find that I was the first person in that day to take the Unmanned Aircraft – General (UAG) test. The staff was friendly and as I waited to complete my paperwork we discussed my reasons for taking the test; to support commercial UAS use at Oregon State University. The FAA announced the Part 107 rules in June of this year and I signed up immediately. Study material was sparse at first. What should I study? Am I really going to need to know everything in the 726-page Aeronautical Information Manual (AIM) just to fly my drone commercially? Did I just spend $150 on a test I wasn’t going to be able to pass? 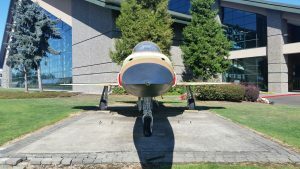 An aircraft on display outside the Evergreen Aviation Museum. The museum is just North and across the highway from Jerry Trimble’s Helicopters. Luckily study material became available about a month before the test and I got to work. I learned to properly read the FAA’s Sectional charts, decode meteorological reports (METARS), and use an aviation radio to listen in on ATC communications. Even with all of my studying I walked in to Jerry Trimble’s Helicopters nervous that I wasn’t prepared. After finishing the initial paperwork, I was led to a small room in the back of the building that contained a few computers loaded with the Computer Assisted Testing Service (CATS) program. The test consisted of 60 questions chosen randomly from a larger pool. I was given 2 hours to complete the test and after a few more signatures and instruction, I began. The actual test went quickly and I completed it in just under a half hour. I will include links to the study material I used at the bottom of this article. When testing I wasn’t hit with any “curveballs” or questions I didn’t expect, but I was surprised at the test subjects. In my case, the majority of the questions centered on reading sectionals and understanding airspace. 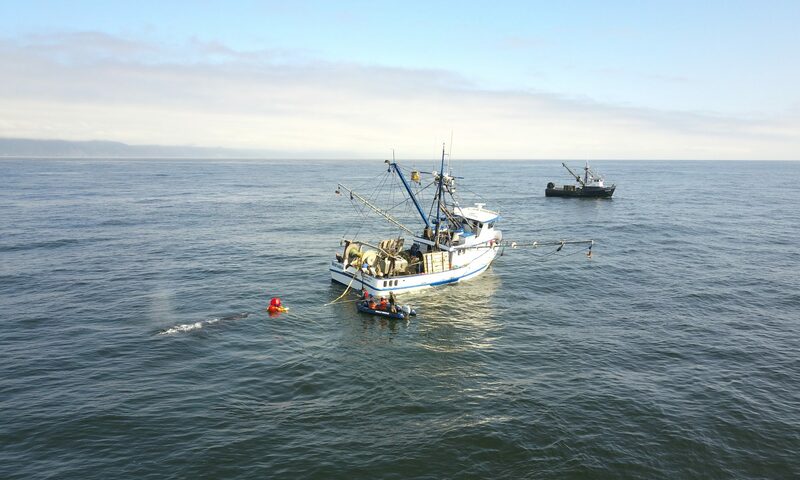 Many of the questions presented a situation where, as the Pilot in Command (PIC), you would be expected to make decisions about safety and legality. Additionally, I encountered questions regarding aircraft performance, weather and environmental factors, and crew resource management (CRM). After finishing the system gave me my score; I missed 9 out of the 60 questions but I passed. The FAA Aeronautical Sectional Charts are available to study online. As someone who’s self-taught I’m very happy with that score. I was able to review the questions I missed and I now know what I need to study up on. I would encourage anyone who plans on testing to spend as much time as you can familiarizing yourself with the FAA’s Sectional Aeronautical Charts. The test covered almost everything you are likely to find when using the charts to evaluate your airspace. The goal of the Part 107 rule is to help Remote Pilots safely integrate their operations into the National Airspace System (NAS) and I believe this test will ensure just that. I’m now waiting the 24-48 hours required for my test information to arrive to the FAA at which point I’ll apply for my certificate. This will most likely be the step that involves TSA vetting, a requirement that the FAA has been largely silent on. If all goes well I’m hoping to be one of the first FAA certified Remote Pilots in Oregon, and maybe in the United States. 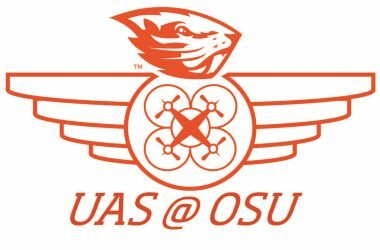 I’m hoping to use my knowledge to prepare others at the University for certification so we can continue to grow a community at Oregon State focused on the safe and legal use of drones. You will find study material along with practice questions and a link to sign up. Good luck! 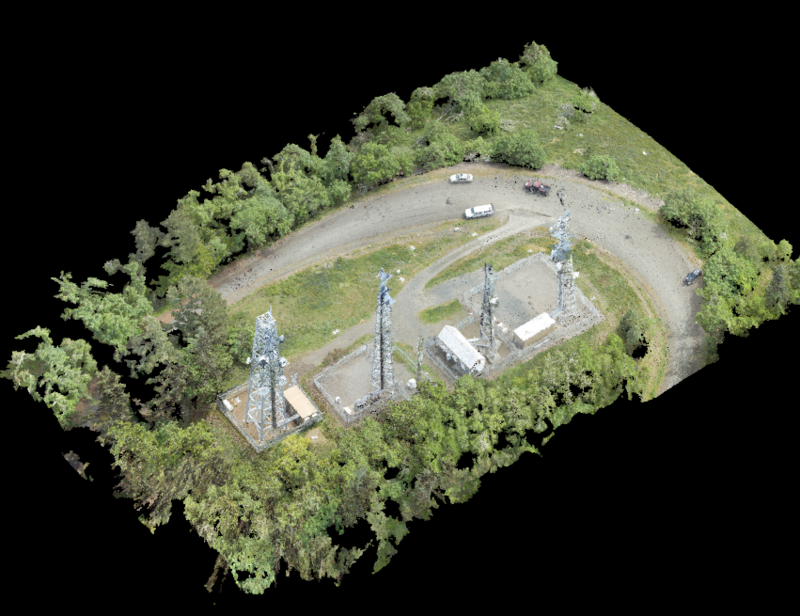 Corvallis, Oregon, July 25, 2016 – In late June, 2016, the Department of Transportation’s Federal Aviation Administration announced its new rules regarding the commercial use of small unmanned aerial vehicles (sUAS). The new rules lowered the barrier to entry for people looking to use drones for commercial purposes by offering a new UAS pilot’s certification. The Remote Pilot Certificate (RPC) allows pilots to operate their UAS in uncontrolled airspace with few restrictions. Additionally, pilots may operate in controlled airspace by petitioning an amendment with the FAA, much like the old 333 Exemption process. Unlike the old system, Part 107 does not require pilots to have any level of pilot training. Instead, the pilot must pass an FAA-proctored exam designed to test pilot knowledge of UAS safety, legality, and manned aviation. The first tests will begin when Part 107 takes effect on August 29th. Research conducted using OSU’s aircraft is not classified as commercial use. Research is considered public use by the FAA, therefor Part 107 does not apply to research work. The important takeaway from this is that researchers will still need to operate under OSU’s COAs to fly. However, Part 107 opens up the option to use a registered aircraft for commercial purposes such as recording promotional material. The FAA will allow public aircraft to act as commercial aircraft at the discretion of the Pilot in Command (PIC). Matt Gillins (left) of the College of Civil and Construction Engineering and John Rohrer (right) from Drone Complier fly the SenseFly Albris during flight testing. 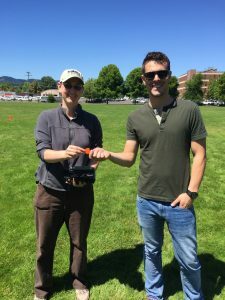 Corvallis, Oregon, July 13, 2016 — In May, 2016 the FAA granted Oregon State University a Certificate of Authorization (COA) to fly drones for research purposes. Within the COA the FAA outlined the rules for researchers flying drones, along with monthly reporting requirements for the University. 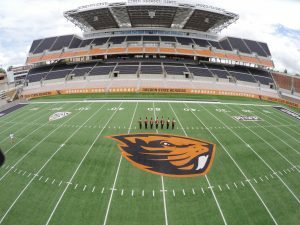 With almost 40 registered drones and 50 identified pilots, OSU met the challenge of managing its flight operations by partnering with local business. 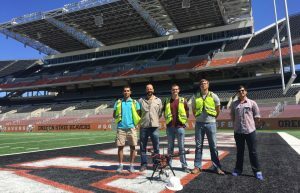 Drone Complier Enterprise, a local drone compliance and business management start-up based in Corvallis, OR, agreed to work with OSU to meet the rising need for both flight management and training. 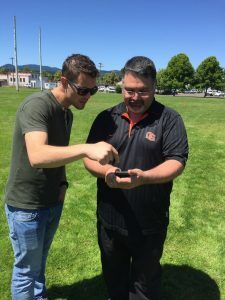 Students were trained in using the Drone Complier mobile app to manage their pre-flight and post-flight checklists, flight time logging, and maintenance reporting. Drone Complier held its “alpha” class of 7 faculty from various departments around campus in late June. Oregon Department of Aviation Director Mitch Swecker was also present to see the OSU training program in action. The initial group was trained in safe and legal drone operations, the basics of flight, and given an introduction in using the Drone Complier software to manage their flight operations. The class was encouraged to provide feedback on the course, which was then used to finalize the curriculum. After two days of training each student was given an in-flight examination that tested their proficiency behind the sticks before being granted their “wings” and the ability to fly under OSU’s COA. Success! Cara Walter (left) gets her wings. Training will be available to interested faculty and staff starting August 1st. The final course will focus on scenario-based training and will last 3 days with flight testing possibly leading into a 4th. Students are required to have a total of 5 hours of flight time logged (including simulator time) before attending a training session. If you are a staff member interested in going through the class please contact Mark Peters in the research office to sign up. 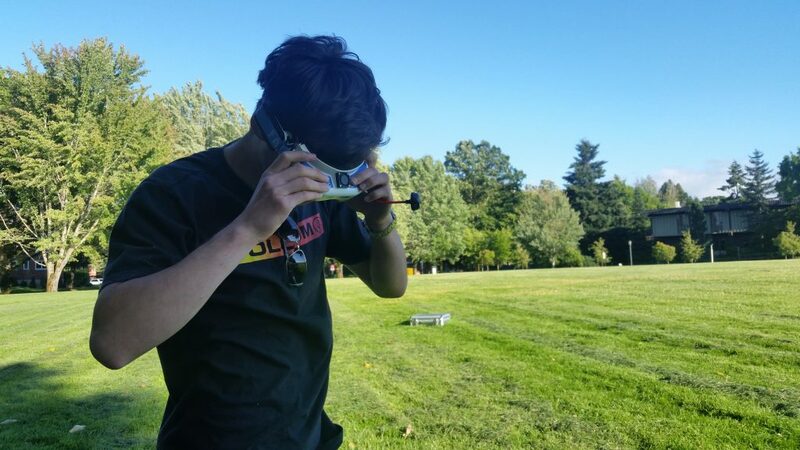 Corvallis, Oregon, July 7, 2016 — The Pacific Northwest Drone National Qualifier race will be presented on July 16th at Camp Fraley in Bend, Oregon as a part of International Drone Racing Association (IDRA), the leading global organization in first-person-view drone racing. 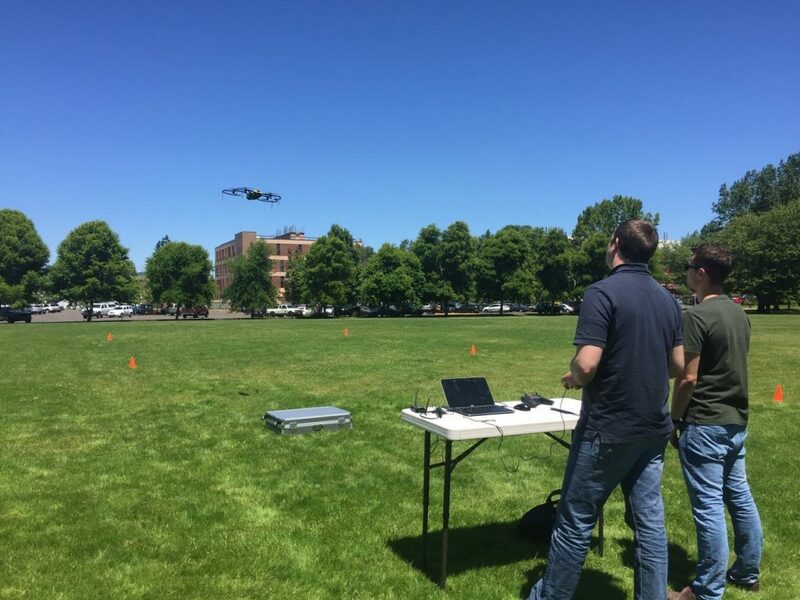 Local Oregon startup Drone Complier is the presenting sponsor of the event, made possible by the dedicated efforts and generous support of the Roswell Flight Test Crew, the Cascade Chapter of AUVSI, Drone Eclipse, Quadrysteria, and SOAR Oregon – the statewide non-profit dedicated to the emerging drone industry. This is the first ever National Qualifying event in the Pacific Northwest. Sixty pilots will travel from points near and far to compete for the top five spots, allowing them to advance to Nationals in New York City in August. Drone racing is enjoying a massive rise in popularity and poised to become the next behemoth racing sport alongside NASCAR and Formula 1. 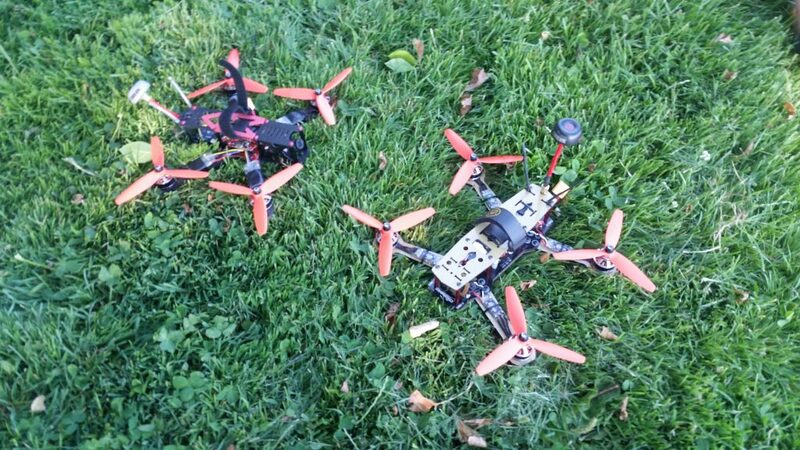 Pictured here: Two quads owned by OSU student Zachary Noble. One of these aircraft will compete in the event Saturday. The event in Bend is free and will be a family friendly spectacle. Attendees are allowed and encouraged to bring chairs, shade, and picnic gear as the race course is on an expansive large field in beautiful Central Oregon. Doors open at 8am for competitors and set-up, with the races commencing at 10am. Pilots will race in twenty heats on a winding, one kilometer-long track with gates and flags. Those who complete the course without missing a gate and the fastest times will advance. ESPN will cover the 2016 U.S. National Drone Racing Championships as the coveted title of fastest drone pilot in the United States will be awarded. The finals will take place on Governors Island, New York City, August 5th-7th, offering jaw-dropping views of both lower Manhattan and the Statue of Liberty. The 2016 U.S. National Drone Racing Championships and the 2016 World Drone Racing Championships in October will be streamed live in full on ESPN3, and presented soon after as a one hour special. The International Drone Racing Association (IDRA) is the preeminent, global drone racing & extreme rotor sports entertainment company. With over 35 participating countries, IDRA will produce the inaugural 2016 World Drone Racing Championships, officially crowning the first world champion. With groundbreaking drone technology, racecourse design, and advancing safety standards, IDRA welcomes innovation and seeks to raise public awareness of the sport. For more information, visit http://dronenationals.com.